Provides clean calories and premium protein to help add muscle. Enzyme fortified for increased absorption. Delivers higher quality carbohydrates that provide fuel and is stacked with healthy lipids; MCT’s, Lecithin, and Phosphatidylcholine (another phospholipid) to help provide more muscle growth support. ALL NATURAL CARBOHYDRATE ENERGY BLEND (MALTODEXTRIN, HIGH AMYLOPECTIN WAXY MAIZE STARCH & WAXY BARLEY STARCH, PURE CRYSTALLINE FRUCTOSE, CANE JUICE SOLIDS), WHEY DOMINANT PROTEIN BLEND (100% TESTED PURE, UNDENATURED, COLD-PROCESSED, PHOSPHOLIPID RICH WHEY PROTEIN CONCENTRATE; UNDENATURED, COLD-PROCESSED CROSS FLOW MICROFILTERED WHEY PROTEIN ISOLATE; CALCIUM CASEINATE), INULIN (CHICORY ROOT FIBER), COCONUT OIL (SOURCE OF MCT’S), NATURAL FLAVOURS, FLAX SEED OIL POWDER, LACTOSE REDUCING ENZYME (LACTASE), PROTEIN DIGESTIVE ENZYMES (PROTEASES I AND II FROM AMINOGEN®), DAIRY-FREE PROBIOTICS (LACTOBACILLUS FERMENTUM), POTASSIUM (CITRATE), <1% LECITHIN (USED DURING WHEY INSTANTIZATION). This is a great product. 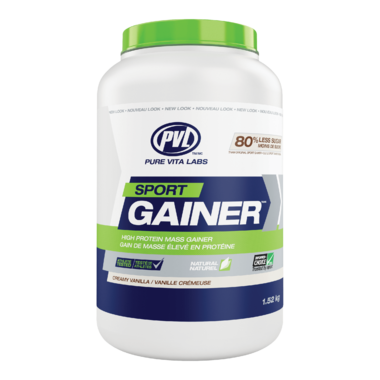 I am an older guy who was losing weight with much increased activity, but PVL Sport Gainer has helped turn things around. I am putting weight and muscle back on, and have more energy. My body is not hungry all the time, craving nutrients, and so I couldn't be happier. Thanks.